Random Stock Grapher (RSG) is a free app designed for people studying the Random Walk Hypothesis of stock-market price fluctuations. RSG uses the Google Chart API, so you need to be connected to the internet to use it. Malkiel went on to claim that charts produced by this method look remarkably like normal stock price charts. He only provided one example, and I wanted to see some more, so I wrote this app. 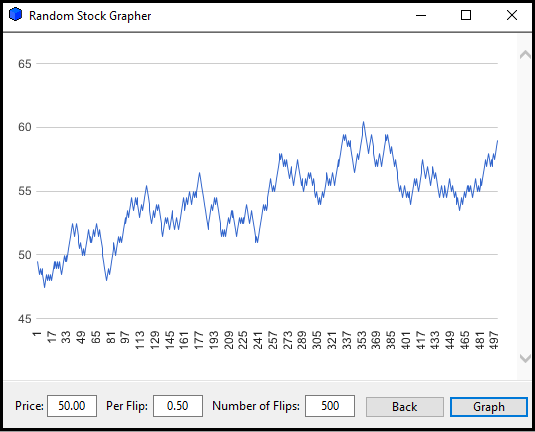 RSG uses a random-number generator to simulate coin flips, and can make random charts far more swiftly. So, you can view random charts as fast as you can click the “Graph” button. I provide this free app to promote my book: The General Theory of Day-Trading. Version 1.0.0 of Random Stock Grapher was released on March 11, 2016.